uPVC stands for un-plasticized Polyvinyl Chloride which is used for making double glazing windows. Such windows have two or three window panes and the gap in-between is sealed with vacuum or inert gas. A spacer is used to separate the two glasses. Double glazing finds its application in making of doors and windows. Different types of materials are used for framing these glasses such as wood, aluminium and uPVC. un-plasticized Polyvinyl Chloride is generally preferred over other materials because of its durability, low-cost and easy maintenance. uPVC windows have several advantages which make them the most popular choice. Preferring uPVC over hardwood or aluminium has the following benefits. a.uPVC windows are high on energy-efficiency: uPVC windows provide good thermal insulation because they don't allow heat to escape easily. 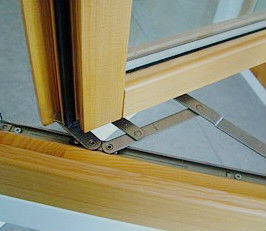 The frames of this material play a vital role in making a building or a home energy-efficient. They not only keep the house warm during winters but also makes them sound-proof as they allow a minimum amount of energy to pass through. There is no detailed analysis to support this but it is estimated that uPVC windows are able to retain up to 50% of the energy. b.They help in lowering your bills: Since uPVC windows can retain heat and other forms of energy, they help in keeping the bills in check. In the winters they prevent heat and cut out cold air, this eventually brings down fuel requirement and also has a positive impact on electricity bills. c.uPVC framing is recyclable: uPVC material is recyclable, making them environment-friendly. This is an essential property of uPVC that makes them preferable over materials like wood and aluminium. d.They are affordable and durable: You don't need to spend much on uPVC windows because of their low cost. This doesn't mean that these frames are of poor quality. uPVC is a material that is highly durable and resilient. Their sturdiness makes them capable of withstanding all types of weather. e.Low maintenance cost: uPVC windows are easy to maintain. Unlike wooden frames, they don't require painting and polishing frequently. They don't rot, swell or corrode. Such windows can be easily cleaned with detergent and a piece of cloth.